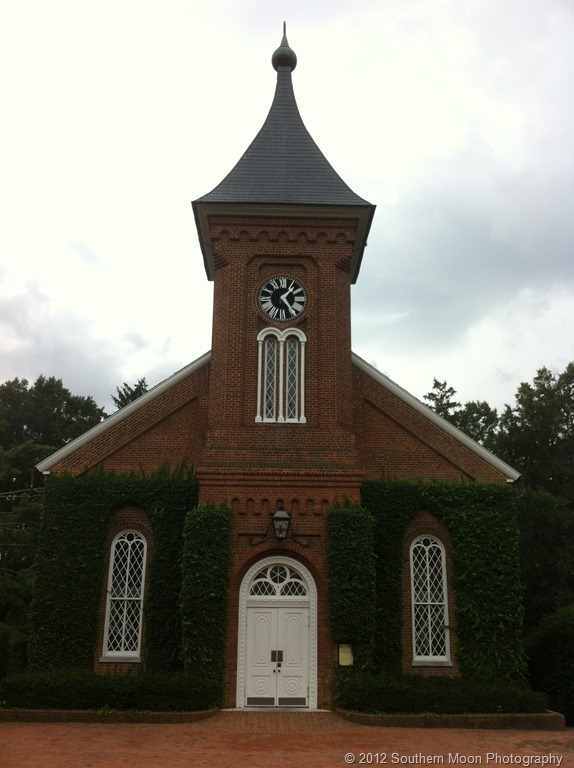 Continuing our day in Lexington, Virginia, our next stop was Washington and Lee University. 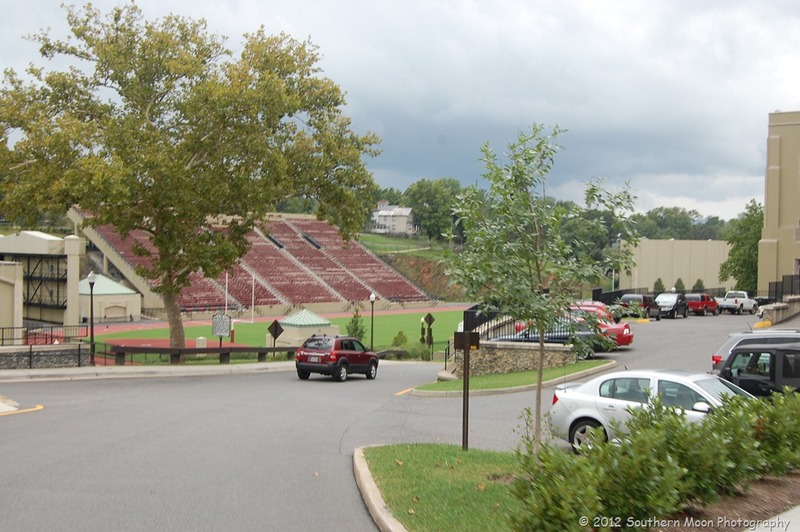 Nestled in the hills of Lexington, this beautiful campus sits atop the hill next to the Virginia Military Institute’s campus. Despite the overcast skies and looming storms, this was a beautiful campus to walk around. It was founded in 1749 and was first named Augusta Academy and went through a move and several name changes, but when native son General George Washington stepped in to help save this all male school in 1796 with its first endowment, it was later renamed Washington College out of gratitude for his generosity. 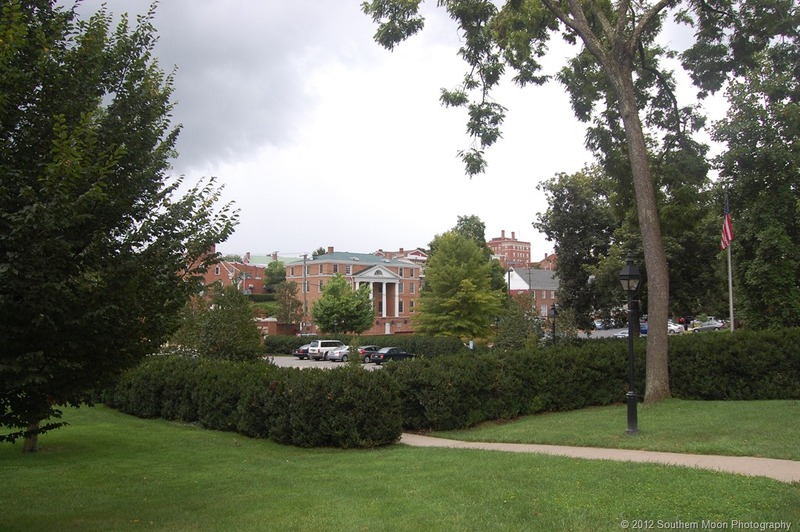 By then, the College was in its present-day location of Lexington. This private, liberal arts school sits between the Blue Ridge and Allegheny Mountains and is the 9th oldest school of higher learning in our nation. Virginia’s other native son, General Robert E. Lee became President of the College in 1865 and worried that his leadership in the Confederacy could bring hostility towards the school. 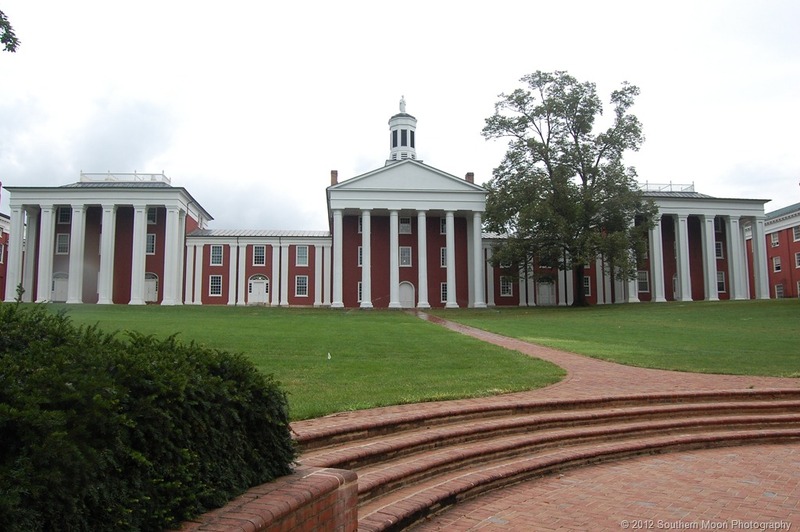 He said that “it was the duty of every citizen in the present condition of the Country, to do all in his power to aid in the restoration of peace and harmony.” Following Lee’s death in 1879, the Board of Trustees voted to change the name of the college to Washington and Lee University. It wasn’t until 1972 when women were first admitted to its Law School and undergraduate women were admitted in 1985. 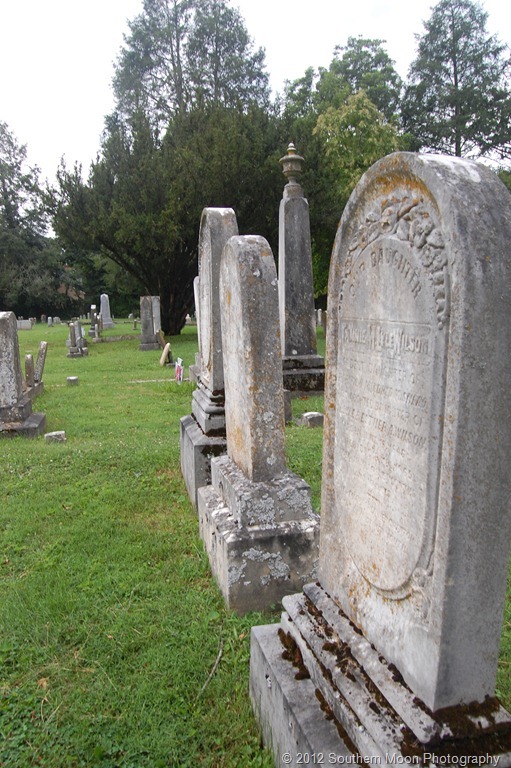 Lee Chapel is where General Lee and his beloved horse, Traveller are buried. We were disappointed that photography is not allowed inside the chapel or the museum, but did enjoy the small collection that is there. If you know in advance that you will be there, you can request express written permission from the University, but there are severe restrictions and limited allowances for use of the photos. When you walk into the chapel’s foyer, you have an entrance on either side. Rows of white pews lining both sides, the middle and the surrounding balcony up above seats 500. It is still used today for the University’s most important events, such as concerts, lectures and other activities. Just whispering to each other, my husband and I could tell that the acoustics are absolutely wonderful in this Chapel. (One cannot walk into this Chapel and not whisper! It just isn’t right to speak loudly in there!) General Lee’s favorite pew is marked with a plaque and shows that the General enjoyed sitting right up front! At the front of the chapel behind the wooden stage, nestles the monument of a reclining General Lee, without his sword at the request of his beloved wife. You may think that he is interred at this very spot, but he is not. 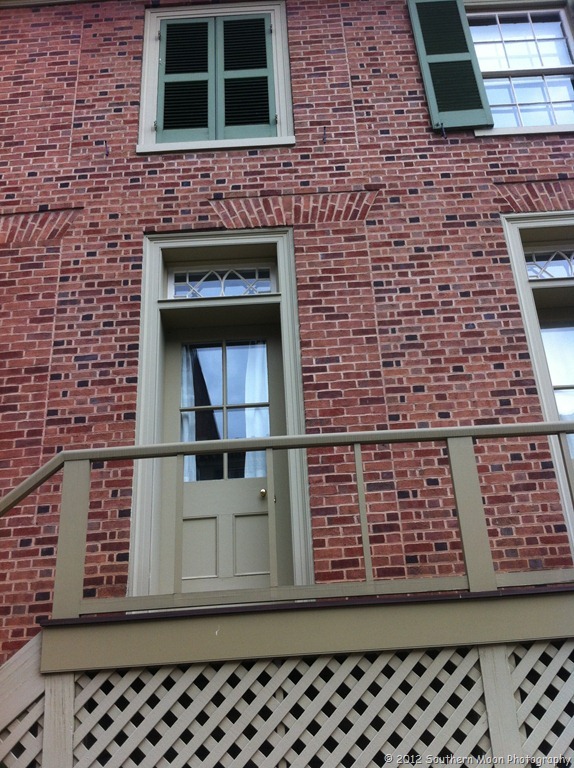 You have to take the narrow, winding stairs downstairs to the crypt where General Lee and several of his family members are buried. Also downstairs is a small museum and gift shop. Traveller’s grave is just outside the door as you exit. Our last stop was for another Confederacy General, who happens to be one of my husband’s favorite civil war historical figures. He is General Thomas “Stonewall” Jackson. 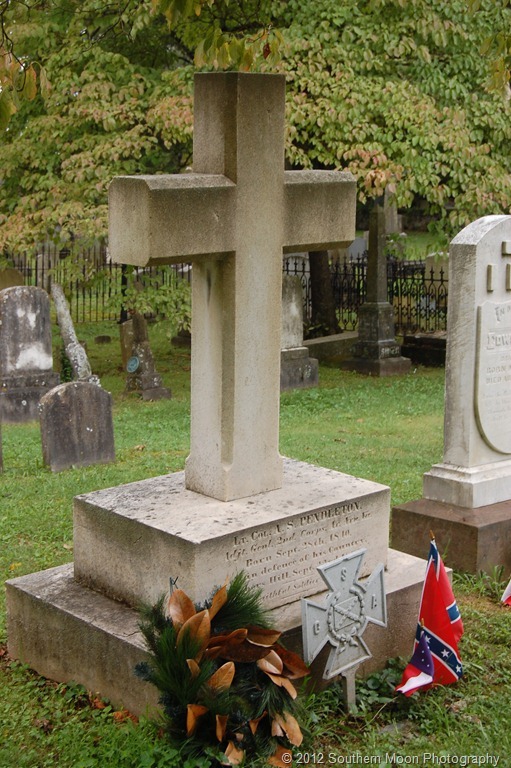 A professor at Virginia Military Institute (VMI), he is also buried here in Lexington. 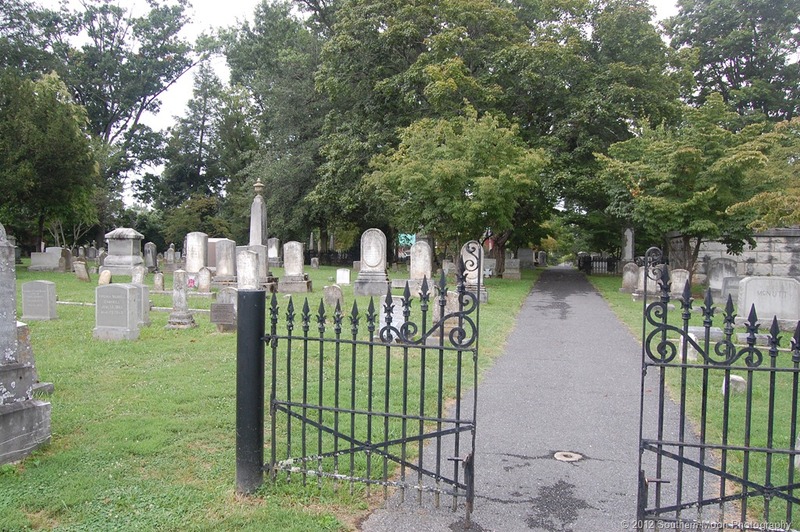 Set right on the main street, leading into town, the wrought iron fence points the way to the tomb of Stonewall Jackson. Thomas “Stonewall” Jackson, Confederate General, is one of the most well-known officers of the Confederacy after General Robert E. Lee. He was considered to be one of the best tactical commanders in the history of our great nation. 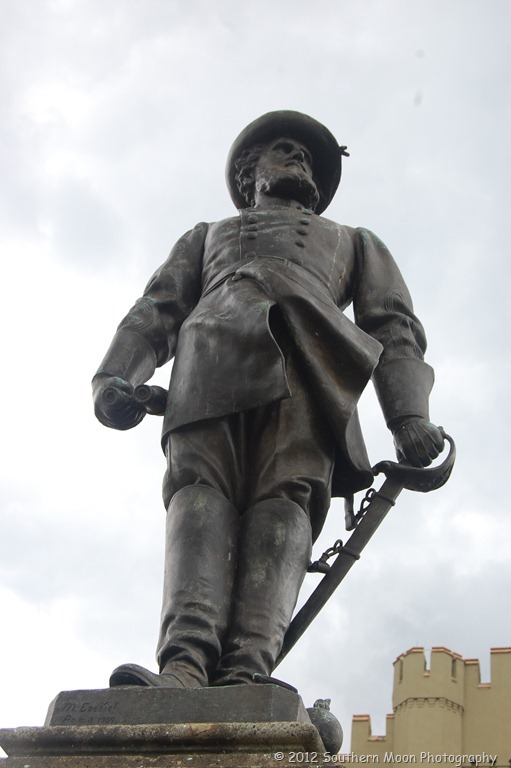 He was a graduate of West Point and from there served in the Mexican-American War from 1846 to 1848. It was during that time he first met Robert E. Lee. It was at Bull’s Run that General Jackson earned his nickname, “Stonewall”. Crumbling under heavy Union assault, the Confederate lines were lucky to have General Jackson’s brigade there to provide crucial reinforcements stoically demonstrating the discipline that he had instilled in his men. Brig. 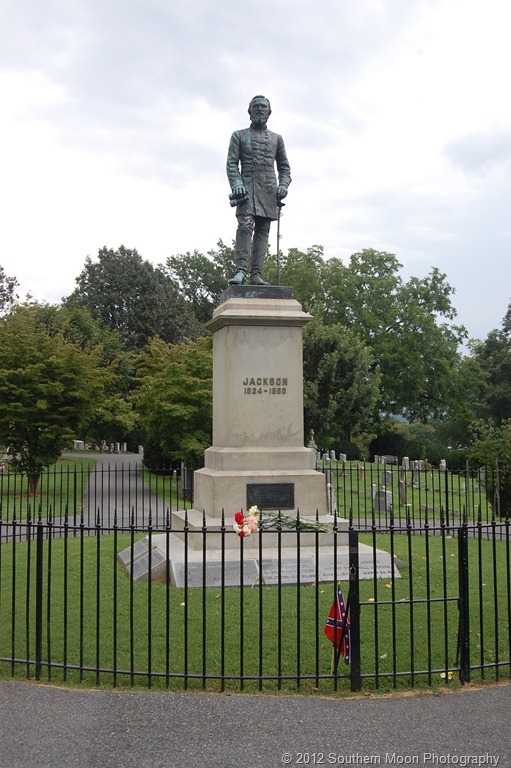 General Elliott Bee, Jr. inspired his men to re-group by shouting out that there Jackson stood like a “stone wall” and to rally behind the Virginians. 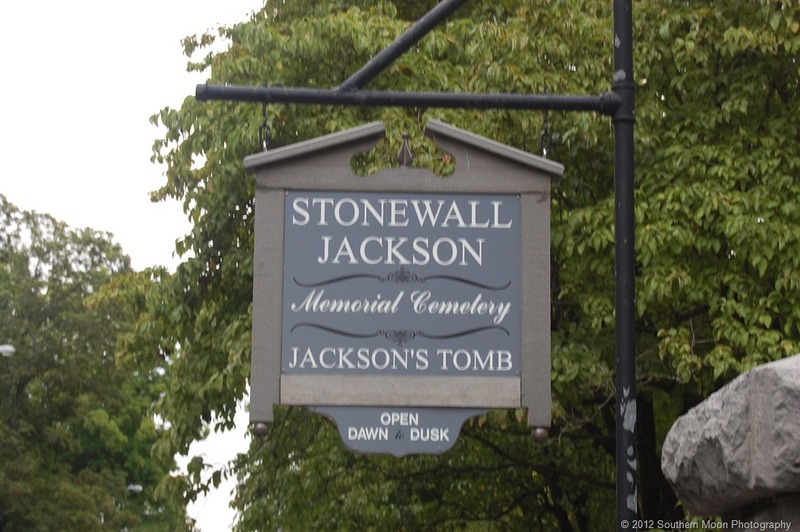 Despite the controversy that followed the intent of the statement, General Jackson was forevermore known as “Stonewall” Jackson. 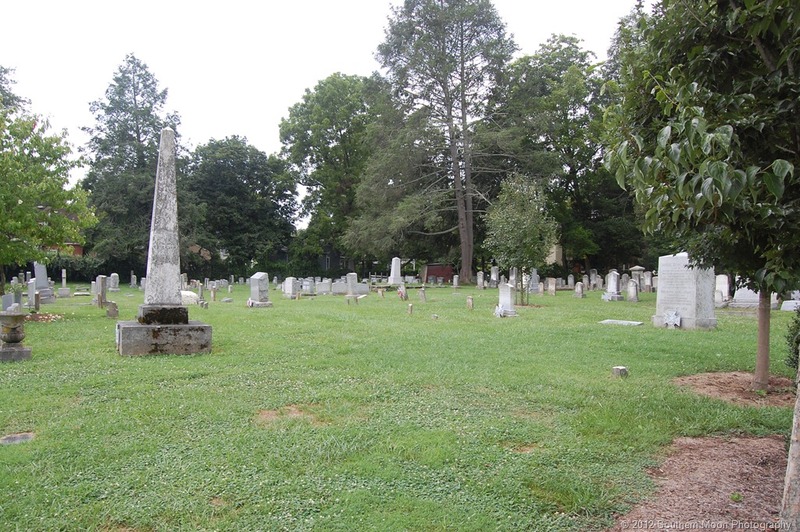 We were able to take a few more photos of this serene corner of Lexington. We didn’t walk all around the cemetery as there was a service in session. It is a beautiful place for so many who have been laid to rest here. Thank you, Lexington for such a nice afternoon filled with so much history! Growing up in a mixed culture home provided many advantages, one of which was a wide variety of foods and flavors. From a very young age, I learned to enjoy many different types of dishes. One of our favorites and one that isn’t eaten very often, is my Mom’s version of Grandma’s vegetarian spring rolls. Be warned, these are not a low calorie food! However, for a once in a while treat, these are great to add to the weekend menu. A food processor will speed up the process, but I have found from past experience that it chops the veggies much to small. For me, hand chopping everything is relaxing for me and I can control the size of the cuts. Begin first by cutting the tofu into small blocks and browning them so they don’t fall apart. 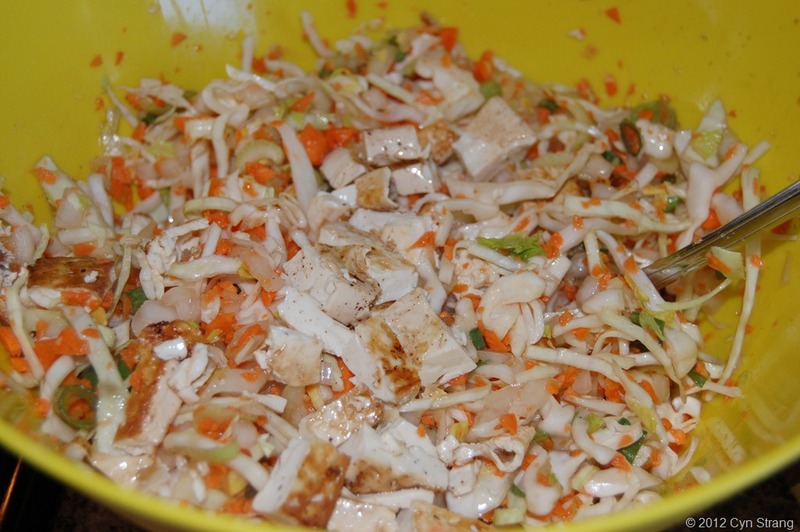 If you would rather they “disappear” into the eggrolls, then don’t brown them, just dump the cubes into the bowl and as you mix everything together, they will break up into smaller pieces and crumble. 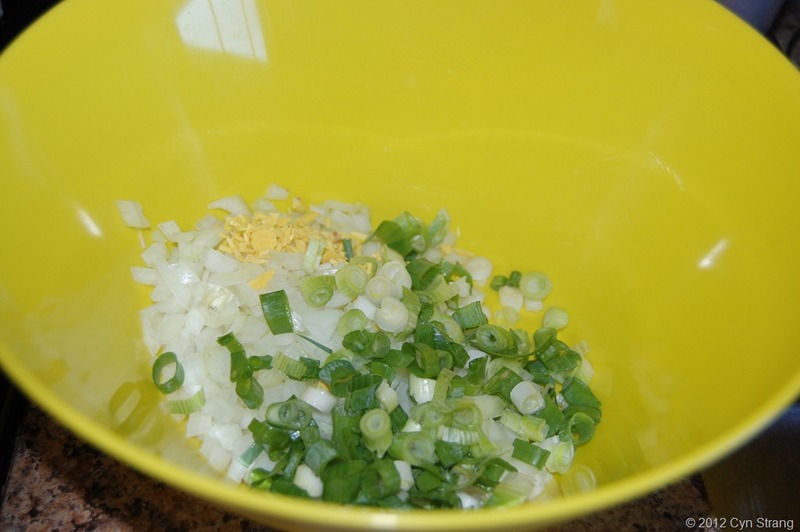 Finely chop the onion, green onion stalks, garlic and ginger root. Place them in a big mixing bowl. At this point add the Bragg’s Liquid Aminos or salt and big pinch of sugar. Let the mixture “marinate” for about an hour. You will see juice in the bottom of your bowl. That’s when it’s ready to roll. 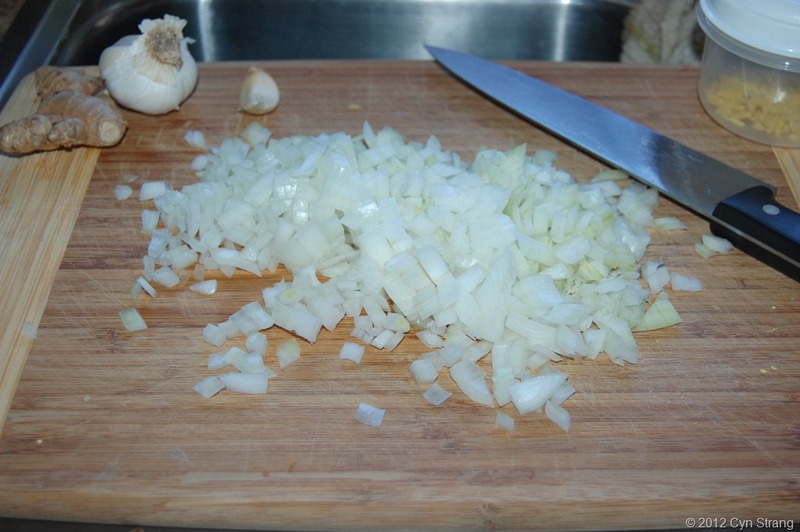 Fill a frying pan half-full with canola oil or other frying oil. Make sure your oil is hot. 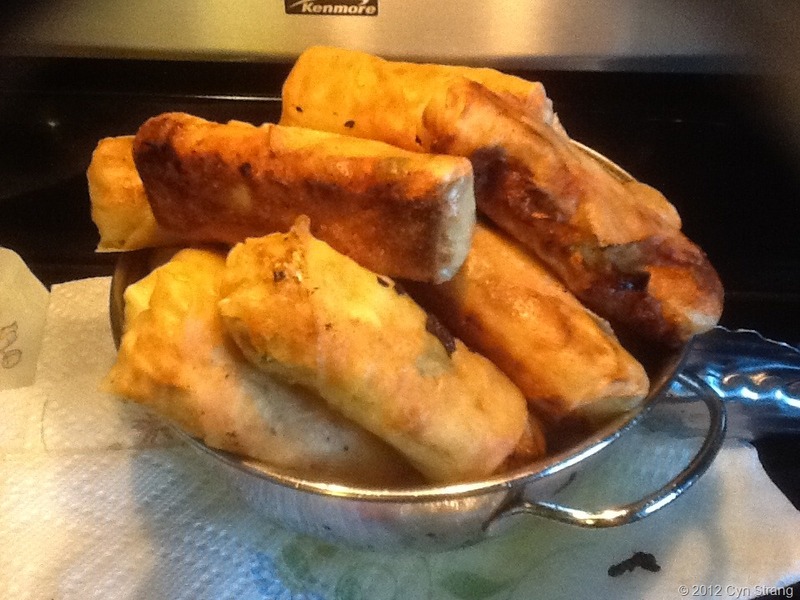 You want the egg rolls to fry almost immediately and not sit in the oil for very long. Place about a tablespoon of filling in the middle. Fold the bottom up over the filling and roll once. Fold in the sides to make and envelope. Pinching lighting, roll and then dip your finger in water and seal the flap. Roll only enough to fill your pan. I usually have 4 across the middle and 1 on each side for a total of no more than 6 in my pan. Fry until brown and flip one time. I stand them on end in a colander with a paper towel underneath on a plate to drain as much oil as possible. No worries if they break and the filling comes out. It happens. Those ugly ones you get to eat first! Continue rolling until you are done. This batch usually makes 1-1-1/2 packages of wrappings depending on which kind you use (grocery store vs. Asian market). I’ve had friends vary out the stuffing with curried veggies and rice/potatoes! I’ve not personally tried it, but you can get really creative with these! Serve with duck sauce, plum sauce, nuoc mam (Vietnamese fish sauce), peanut sauce or just by itself. Great appetizer with rice and other Asian dishes. To reheat and make them crispy – lay in a single layer on a baking dish and reheat in a 350F oven turning as they re-brown and re-crisp. Serve hot! Ordinary? We don’t do ordinary! 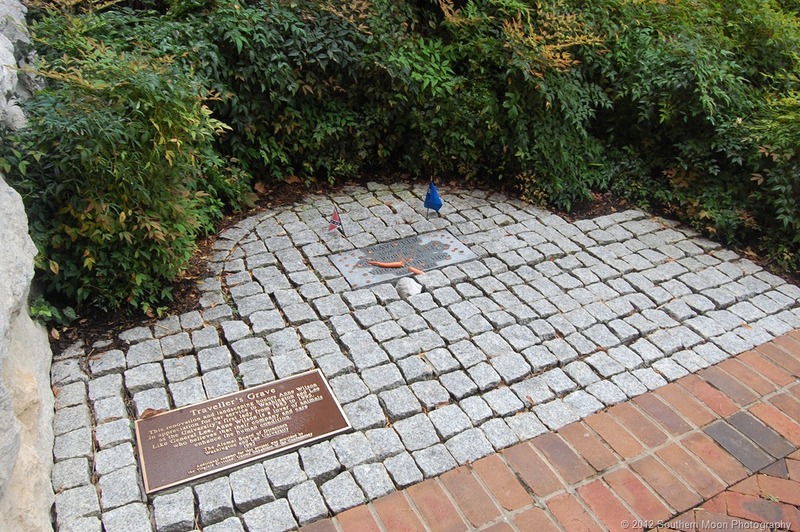 Lexington, Virginia is a well preserved downtown and its historical sites invite you to step back through time. 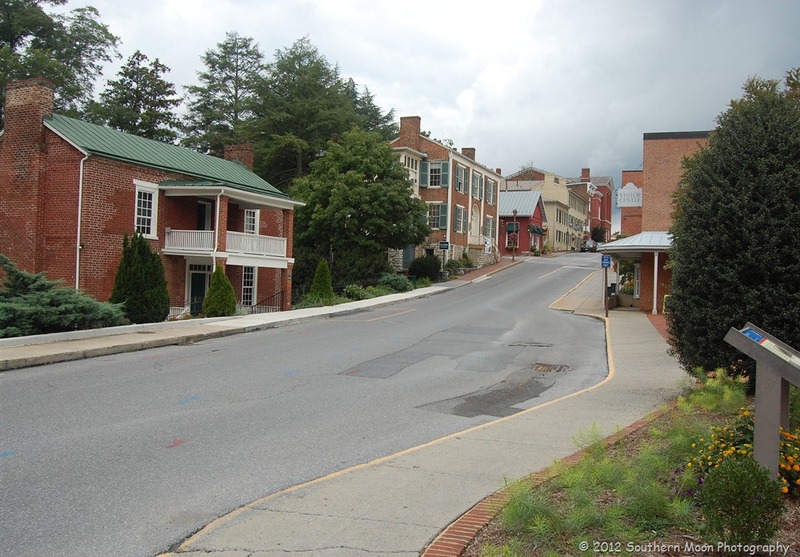 Taking the short jaunt off of I-81 into Lexington, you’ll find it is a winding path that leads to a beautiful little town tucked into the hills that make Lexington. Our first stop was at the Visitor’s Center on East Washington Street. 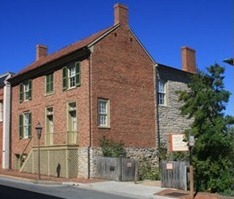 Lexington is a picturesque town and the Civil War era buildings give each street so much character. Who knew so much history is tucked into these rolling hills? 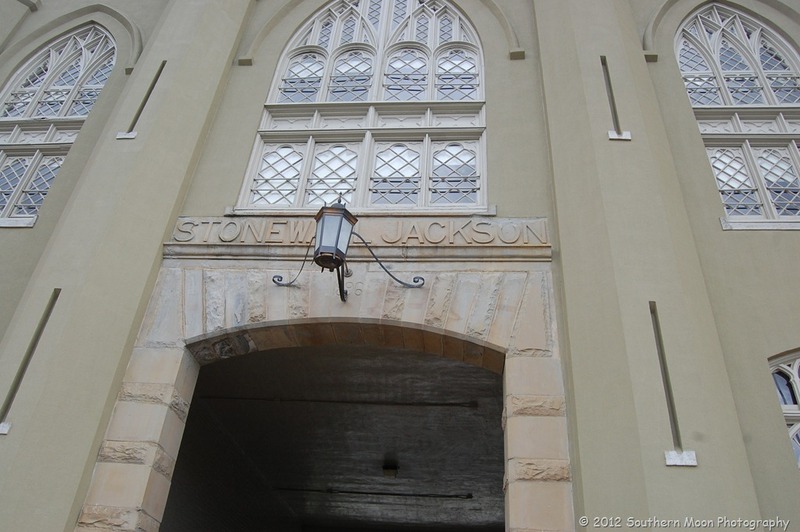 Driving through Downtown, you pass this ordinary door not realizing that it was the home of Stonewall Jackson! It is open daily March – December. For those of you who didn’t know, General Jackson was a professor of Natural and Experimental Philosophy in 1851. 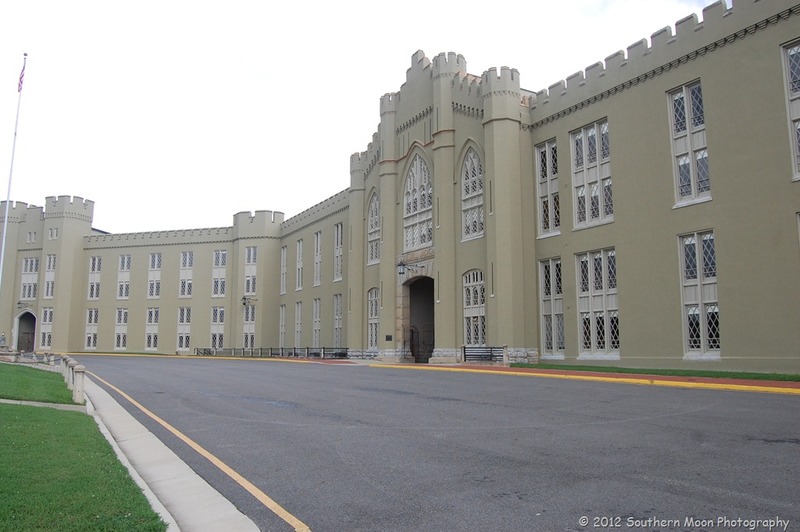 Sitting on 134 acres, 12 are designated as the Virginia Military Institute Historic District and since 1839 Virginia Military Institute has been educating and preparing cadets to lead is all aspects of their lives. 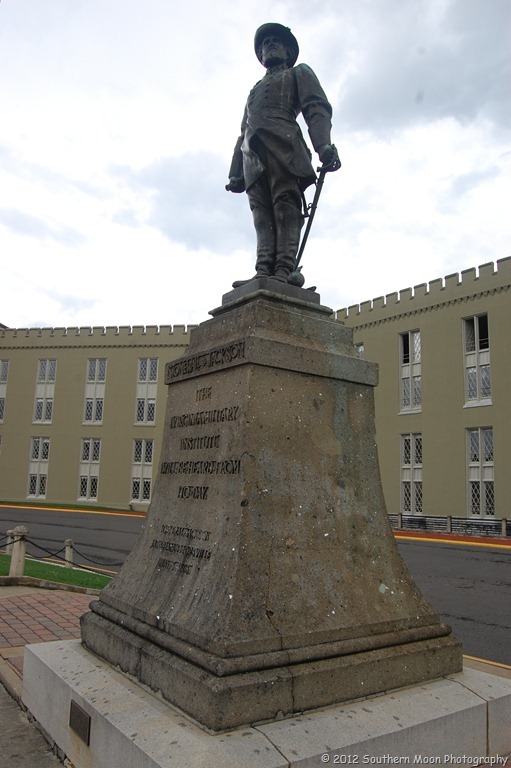 It is the oldest state-supported military college in the United States. After driving through town, we decided to walk around this hilltop campus. Some notable alumni include George S. Patton, Sr., grandfather to George Smith Patton, Jr.; Benjamin Franklin Ficklin, a founder of the Pony Express; Harry Watkey Easterly, Jr., President of the USGA and First Executive Director; Baseball player Ryan Glynn; General George Marshall, Nobel Prize winner and US Secretary of Defense (1950) as well as the Chief of Staff of the Army during World War II; Brigadier General Frank McCarthy who was also a producer of the 1970 Academy Award winning movie Patton; Pro football player Bobby Thomason who was an NFL Pro Bowl Quarterback; Basketball player Reggie Williams and actor Dabney Coleman. Four of the Barrack’s five arched entries are named after George Washington, Thomas “Stonewall” Jackson, George C. Marshall ‘01, and Jonathan Daniels ‘61. 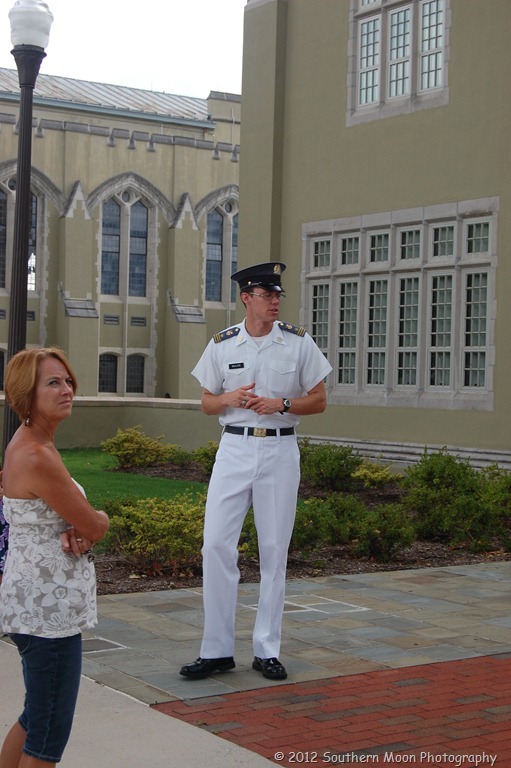 Cadet-guided tours of the campus are available and can be arranged through the VMI Museum. 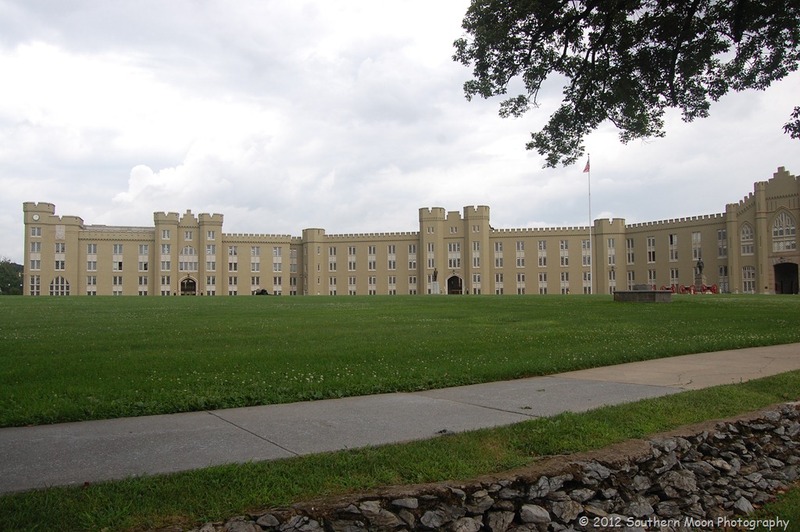 They are offered daily and begin at the lobby of the VMI Museum in Jackson Memorial Hall. 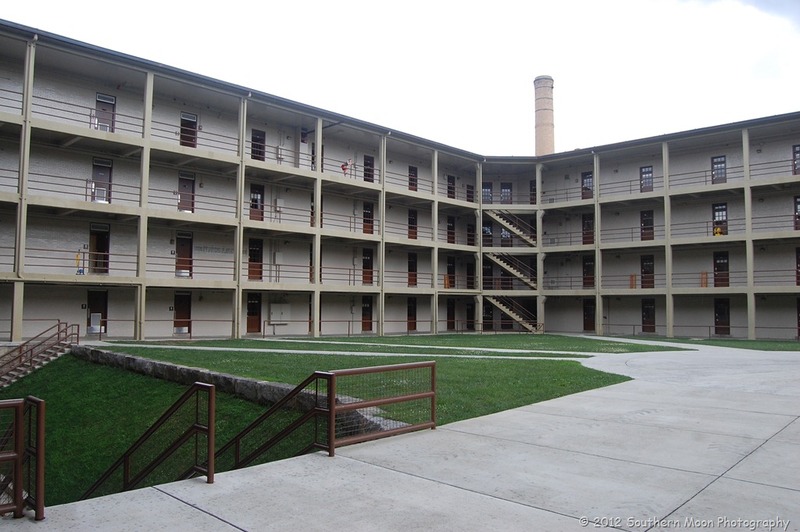 Here is an inside courtyard view of the barracks. The parade grounds are impressive! Here is an awesome view from the end of the field by Stonewall Jackson’s statute. 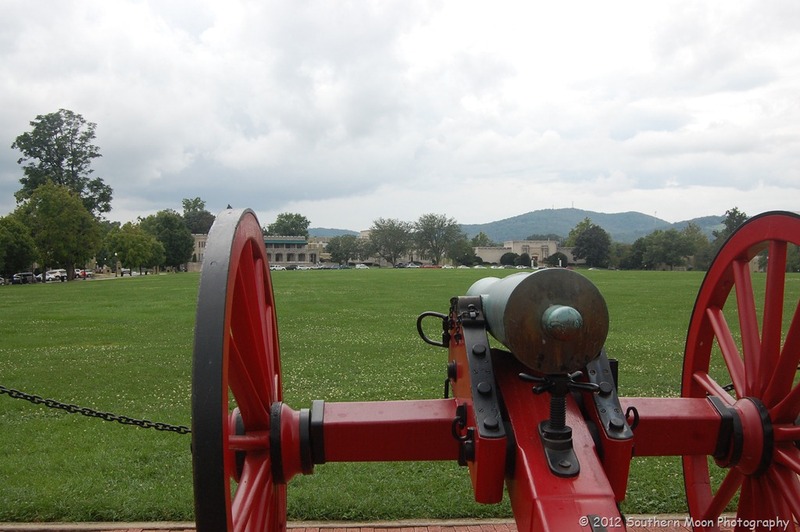 Thomas “Stonewall” Jackson looks over the parade grounds above the cannons. He’s quite the impressive statute! Couldn’t leave the VMI Post without seeing their football field! For college football fans everywhere, a football field is always a must-see! Even though we were leaving the VMI Post, our visit in Lexington was not over. Stay tuned for more….